Samsung Galaxy Nexus may be a few months old but it’s still holding its tramp card as current Google Phone. 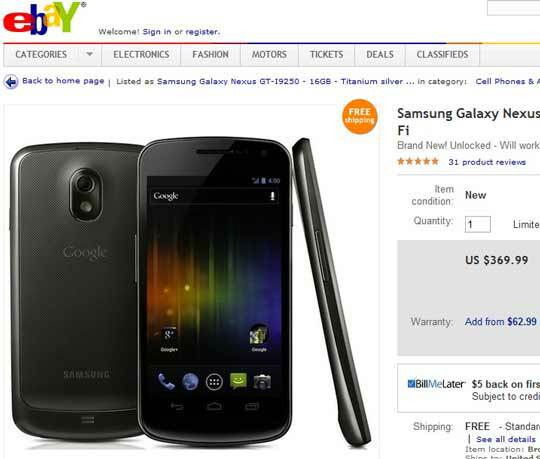 If you wanna buy this kind of phone then Ebay has an awesome offer for you. They are selling unlocked GSM version of Samsung Galaxy Nexus for $370 only. It’s a 16GB version with as usual built in Android Ice Cream Sandwich Firmware. A warranty deal of 2 years can be added for $63 and shipping is free with an estimated delivery date of June 6th to June 12th if you were to buy it today. Obviously you will get 14 days money back promise from Ebay. Let’s give you some reminder. Samsung Galaxy Nexus has a 4.65-inch HD super AMOLED screen with 5 megapixel shooter on the back capable of taking 1080p HD video. On the other side Amazon is also offering the handset as low as $418 now. Luckily there is a $410 offer there for white version of Galaxy Nexus. Both the models are unlocked international version. Keep in mind that these versions are always in the first queue to receive any update from Samsung or Google.